The Parks Conservancy’s signature project, Crissy Field was transformed starting in 2001 from a former military airfield into a beloved national park site through the generosity of the Evelyn and Walter Haas, Jr. Fund and Colleen and Robert Haas, as well as thousands of community volunteers and donors. Today, the restored Crissy Field is a stunning place to walk or bike on a flat, hard-packed promenade with iconic views of the Bay and Golden Gate Bridge. A beautiful and much-loved trail winds through Crissy Field between Marina Green and Fort Point. You’ll find beaches, picnic tables, tidal marsh overlooks, and renowned windsurfing. At the east end, Crissy Field Center serves as a multicultural urban environmental education center for youth. At the west end of Crissy Field, the Warming Hut offers delicious snacks, sandwiches, and drinks—as well as a wide selection of park gear and eco-friendly merchandise. Park in beachfront lots just west of the Marina gate. Bring sweatshirts and sunglasses for the kids, as the wind can blow sand. Although the water is usually clean and safe, heed warnings when they are posted. The Warming Hut is, appropriately enough, a place to escape the wind and fog that blow through the Golden Gate. The beach can be seen at its widest during low tide. You can legally fish or crab without a license at Torpedo Wharf at the west end of Crissy Field. Look for posted regulations. 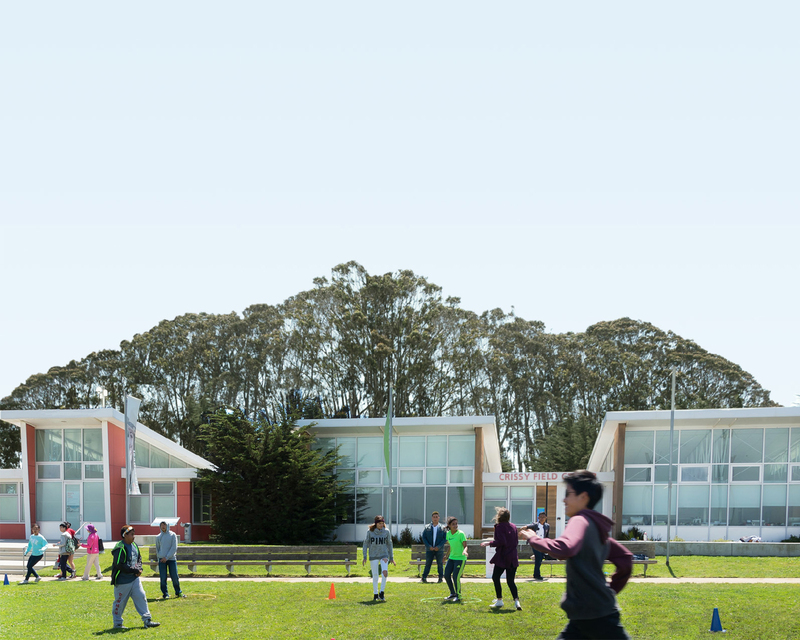 Crissy Field Center has a host of award-winning community and youth programs, including its popular Summer Camp. As part of the restoration, over 100,000 native plants representing 110 species were planted or seeded around the site. Since the restoration, biologists have identified over 17 fish species and 135 bird species in the tidal marsh, including herons, egrets, ducks, and gulls. Also, keep an eye out for the heads of California sea lions as they swim past Crissy Field! Born in the open ocean, millions of crab larvae drift into the bay. The larvae grow into young crabs in food-rich shoreline areas such as the waters off Crissy Field. Because these orange crabs with white claws don’t reach maturity until long after returning to the ocean, it is illegal to trap them in the bay. Crissy Field began as a marsh and seasonal home of Ohlone Indians, and later hosted Spanish and Mexican ships, a Grand Prix raceway, an historic army airfield, and a U.S. Coast Guard station. A row of hangars and a slippery seaplane ramp evoke an era when a squadron of airplanes stood ready for action at Crissy Field. This military airfield is actually older than the air force, dating back to the 1920s when flying had barely gotten off the ground. In its time, Crissy Field was the site of many aviation innovations and milestones. In those days, so little was known about nationwide flying conditions that the Army sent a team of fliers from Crissy Field and from an eastern counterpart at the same time to see who could reach the opposite coast first. Once a former Army airfield, Crissy Field has been transformed into a mile-long waterfront park, linking nearby open spaces and enhancing public access to San Francisco’s northern shoreline. The Crissy Field restoration project added educational programs and visitor services by reusing two historic structures for the Crissy Field Center and the Warming Hut. In addition to substantial habitat restoration, new construction included the East Beach restrooms and other visitor amenities. The project also included removing 87,000 tons of hazardous material, 15,000 tons of shoreline rubble, and 230,000 cubic yards of fill material for the restoration of the tidal marsh alone. The National Park Service and Parks Conservancy began community engagement, planning, and fundraising in earnest in 1994. Incredible community support, following a visionary leadership gift from the Evelyn and Walter Haas, Jr. Fund, made this project possible. The Parks Conservancy managed the planning, design, and construction, as well as ongoing community engagement and volunteer habitat restoration efforts. Crissy Field opened to the public in May 2001, when at least 75,000 people attended the opening week celebrations that capped this post-to-park transformation. The Parks Conservancy has continued to support ongoing operations, maintenance, and fundraising for additional projects in the years since. Get more details about the incredible transformation of Crissy Field here.